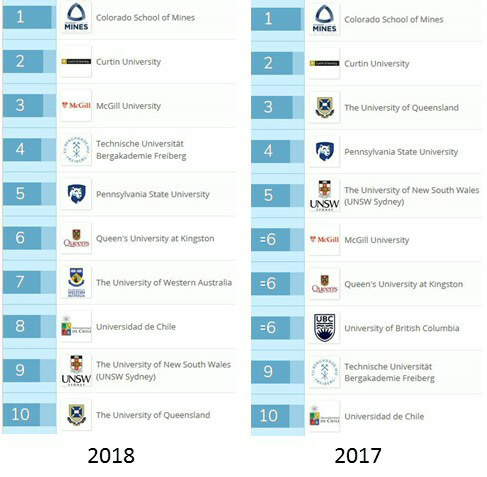 I am happy to see The University of Chile ranked with #8 placement. This is also a good recognition of the quality of mining education in Chile! I have found that it makes for an interesting read to look into the mineral processing component of a 'mineral processing' related degree at various universities. It's often pretty lean. Hass anyone else taken a close look or discussed with recently hired process engineers. Yes Barry, agreed, the last two years they seemed to have identified the true schools of minerals engineering and mining engineering. I always found it strange how universities that didn’t graduate any mining or metallurgical/minerals engineers could be listed! Chemical Engineering and Earth Sciences are separately ranked. 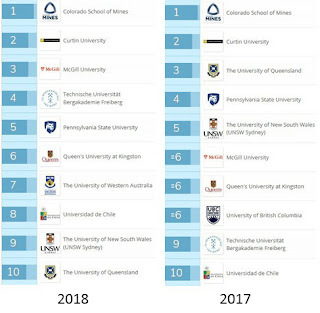 I suspect petroleum engineering, exploration geophysics, mine surveying and mineral & energy economics might all be added to this field (as many are not ranked separately and mining and petroleum is often combined). In the case of Curtin University , all these areas are being taught and have active research groups performing R&D in this space. Yes Jacques, Barry. That's why Uni Sth Australia is absent. No degree program. Might be different if the ranking was for research.